So the 2016 head coaching, cannon ball run racing circuit has concluded 6/7ths of an entire lap, and the Miami Dolphins demanded the drivers seat to take the first RIGHT turn down Adam Gase Avenue. As the most youthful road on the map Gase avenue has yet to be paved though he's every-bit as prominent a direction to getting around NFL town versus the opposing traffic. Of course the same TV, radio show host, and/or call in to hear their own voice skeptics that suggested in past acquisitions that the Dolphins waited too long and ended-up with the bottom of the barrel, are in 2016 screaming at the bumper in front of them that Miami acted too fast in making their number one target of the 37 year old Gase into their own personalized license plate. The Dolphins had their choice of pretty much whatever model they may have wanted as they came to their conclusion an entire week before any of the other six teams just recently decided on their choice's of fuel mileage. Minus Tennessee's Titans. Who may go with the lone remaining viable option Doug Marrone (51) with the same NFL years as Gase (37)? or Don Shula (though two franchises went with the up-and-coming route of youth)! New York's Giants parted ways with long time (since the 1800's) guru Tom Coughlin while still under contract which meant that he couldn't be spoken to without the permission of the Giants while only rival Philadelphia bothered. The franchise of G-Men replaced Coughlin with their offensive coordinator of two years Ben McAdoo who at (38) becomes the leagues second youngest head coach. He has 12 NFL years with just the two as an offensive coordinator. Tampa Bay promoted their own offensive coordinator of one year with a name we all know (snicker), Dirk Koetter who is (57). He has just nine years in the NFL though all nine are as someones offensive coordinator (Jags 2007 - 11, Falcons o12 - o14, and 2015 with the Bucs). Philadelphia's Eagles (though not official until Kansas City's playoff run is completed) have been ticketed to hire a name that we all actually do know in Doug Pederson who was at one time the backup quarterback in Miami to Danny Marino. The Eagles go from Chip Kelly to Pederson who at (47) has just seven years NFL coaching experience with the last three as the Chiefs offensive coordinator. San Francisco with the selection of recently fired Chip Kelly (52) may have made the biggest splash as far as name and head coaching experience goes while also revitalizing the nearly extinguished career of quarterback Colin Kaepernick who's skill-set fits nicely into Kelly's schemes. Kelly has been in the NFL for three years with all as the Eagles head coach 2013 - 2015, (well almost through 2015 before being FIRED) by a 6 - 9 at the time organization. Had the Dolphins offensive coordinator Bill Lazor survived the 2015 season, Chip Kelly would have been a good fit for Miami, but Lazor's play-calling had obviously hamstrung quarterback Ryan Tannehill. So Lazor got the boot, and with him went his NFL methods learned via Chip Kelly. The Browns chose the FIFTY year old Hue Jackson who has an accrued 15 year NFL coaching career with four as an offensive coordinator, and one as a head coach in 2011 with the Oakland Raiders. Miami had a scheduled interview with Jackson that they chose to cancel in hiring the nearly as experienced though inferior in age by 13 years Adam Gase. Should all go as planned for both teams? When Gase is FIFTY he'll have 27 NFL years with the same one year fewer as a head coach to Hue Jackson who at that same point in time will qualify for Social Security, (along with all the others besides McAdoo & Gase). Miami snapped-up who was obviously their top guy in the Thirty-Seven year old Adam Gase! He has tabulated (literally) 13 NFL years coaching experience with three as an offensive coordinator before the Dolphins jump-started the opportunity to give him their head coach position for the next five years over six other interviewee's they considered. Those potentialities included the heavily liver spotted Mike Shanahan, Mike Smith, Doug Marrone, Teryl Austin, Anthony Lynn, and the only one of youth Dan Campbell (38) while the gathered three month long list eliminated some 20 plus other potential candidates. Gase had been a hot commodity as a suggested ""quarterback whisperer"" in other teams head coaching searches over each of the last four years, he was even a consideration of Miami's back in 2012 before the hiring of the not so affectionately referred to Droopy-Dog. The Dolphins (unlike the casual skeptic) began their homework assignment three months ago on the day that the previous unmentionable (wouldn't want to cause a stir) head coach was fired. They weren't permitted to drive to the homes and socialize with potential suitors but they investigated every dirt road along the way in finding the shortest route to their destination, and when the meter maids time-frame permitted they swooped-in ahead of a bunch of old men to park it on Adam Gase Avenue. The so called "experts" have Miami with Gase as the third best head coaching selection while they go on to suggest that he may have been the number one guy if not for being just 37. 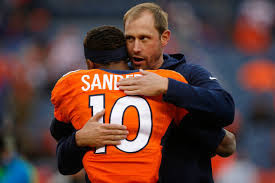 Why with a very similar resume to all the others is Gase being penalized for youth? Vigorous youth and hunger are a good thing. When you have equally experienced and/or talented options, you always go with the young guy, that's the rule of thumb in most every venture! So I ask you with all things considered, and I mean all things! Short and/or Long-Term? Who was an absolutely guaranteed better selection than the Miami Dolphins choice of Adam Gase? Thank-You for an open minded read, and we look forward to your angle of view : )) !! PS. By Miami taking control of the wheel with that first abrupt turn. They were also able to gather practically an entire defensive coaching staff whom also are of relative youth, (without aggressively competitive road raging traffic in their mirrors) prior to the other head coach-less teams deciding upon their main man. The Dolphins are supposedly waiting for some of the playoff teams seasons to end before assembling their offensive staff and whatever else remains. Those along with the already signed, sealed, and delivered will be discussed when the process is complete, and/or in the comments section.